All of these geography courses use a traditional approach. They are typically one-year courses except as noted. Multi-level courses are useful when you want to use one course for several students in different grades. Save teacher time by using multi-level homeschool geography courses. Teach children at different grade levels at home, in homeschool co-ops, or in small Christian schools. Family-friendly courses make it fun to learn geography at home. Print maps as you need them, find recipes from the US and around the world, and learn more about the people and animals of the world. Wonder Maps CD has 350 maps to print from your computer as needed! Children Just Like Me: Celebrations Meet children around the world as they celebrate their favorite holidays. 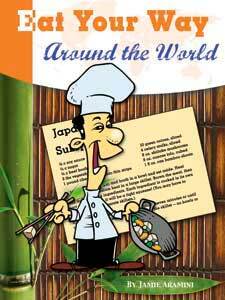 Eat Your Way Around the World is a handy cookbook with recipes from around the world. Uncle Josh’s Outline Map Book or CD-Rom has over 100 outline maps for history and geography. The Physical Geography Flipper is a study aid to learn related terms. Eat Your Way Through the USA is a handy cookbook with recipes from around the United States. 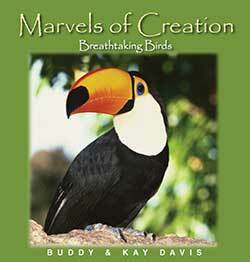 Marvels of Creation: Breathtaking Birds Photographs and descriptions of birds from around the world. Magnificent Mammals Descriptions and photographs of mammals from around the world. Barnabas and Anabel Kindersley, creators of the acclaimed “Children Just Like Me”, meet with children around the world as they celebrate 25 of their favorite holidays and traditions. 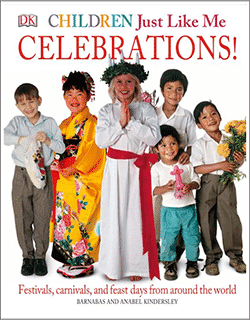 With stunning photographs and illustrations, readers meet each child and learn the significance of the chosen celebration. With WonderMaps, you can use your computer and printer to print all sorts of maps. There are over 350 different maps that you can customize for integrating geography and map study skills with other studies such as history, literature, science or Bible. Multi-level geography and history resource. Eat Your Way Around the World has recipes from over thirty countries. 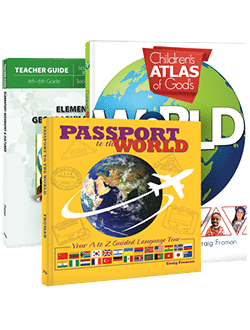 Supplement any world geography curriculum with cultural tidbits for each country include etiquette hints, food profiles, and Culture a la Carte. Some of the activities are a making a food journal, a passport, and having a world travel night. Preview sample pages at the publisher’s website. In Uncle Josh’s Outline Map Book, there are over one hundred reproducible outline maps. Using maps is a foundational part of teaching geography and history. 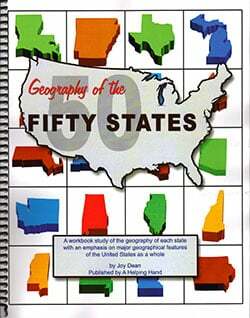 It includes each of the fifty states, continents, ancient historical regions, historical war regions, and more. The Outline Map Book is reproducible and comes in paperback. It is also available on CD-ROM. With the Uncle Josh’s Outline Map Book CD-ROM version, you can print maps as you need them. The Physical Geography Flipper Guide covers axis, altitude, reef, piedmont, strait, inlet, etc. 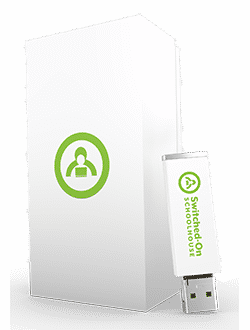 for grades 6 to 10. In Geography From A to Z, there are 63 definitions of words about the earth’s features. Each geographic term is delightfully illustrated in full color. Eat Your Way Through the U.S.A. is more than just a cookbook. Each state has its unique geographical features and agricultural products. These influence both the ingredients that go into a recipe and the way food is prepared. With Eat Your Way Through the USA, you can experience a different meal from each of the 50 states and the District of Columbia. Easy to follow recipes for a full meal from each state are included. There is a set of interesting food facts from each state to supplement your cooking experience. Use this multi-level resource to add cooking experience to your geography curriculum. 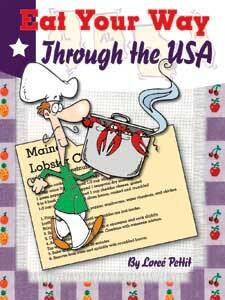 “This is a great cookbook full of wonderful recipes and also teaches children unique facts about each U.S. state. My family especially loves the homemade Chicken Dumpling recipe” Anna J.
Breathtaking Birds is a hardcover book with full-color photographs of birds and descriptions. Magnificent Mammals is a full-color, hardcover book chock-full of great information about animals, from black bear to bass. Buddy and Kay Davis, through their love of nature, have written books perfect for Christian education, or just recreational reading.